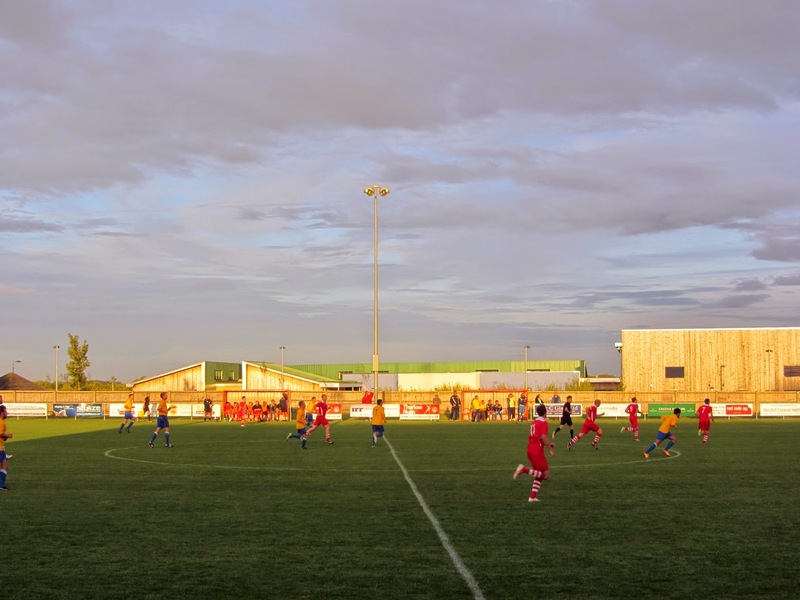 My sixteenth stadium of 2014 was on Tuesday 12th August at The New Croft in Haverhill, Suffolk. The match was Haverhill Rovers vs. Newmarket Town in the Eastern Counties League Premier Division. The New Croft is on the eastern outskirts of the town as part of a larger sports complex. The nearest railway station is the small one at Dullingham around 9 miles north-east of the ground though for connecting bus services Cambridge is more suitable. The venue was opened in 2010 with its name a reference to the club's former home at Hamlet Croft where they had played from 1913 until the move. In addition to Haverhill Rovers, the venue is also the permanent residence of Haverhill Borough FC. 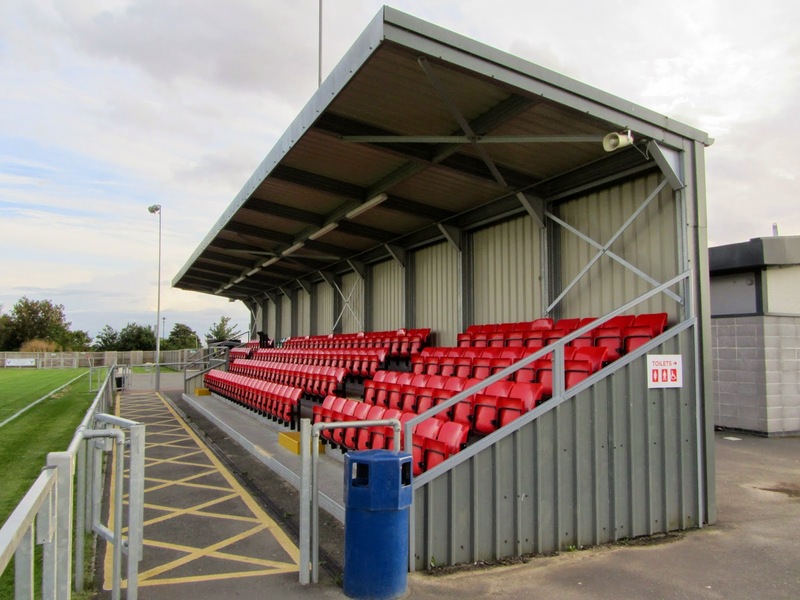 There is a covered all-seater stand capable of holding 158 people located on the western side of the ground. Behind this is the main club building including the bar, food outlet and dressing rooms. There is also an outside seating area to the left of the stand. The New Croft was built 2010 at a cost of £2m and this shows with the club building as it is very impressive compared with other teams in the division. The only other stand in the ground is a small covered metal terrace directly behind the goal at the southern end of the venue. The rest of The New Croft is uncovered standing behind a metal barrier which extends round the pitch. The two dugouts sit on the eastern side of the ground opposite the main stand. This one turned out to be a one-sided affair with a rampant Newmarket thrashing the home side. 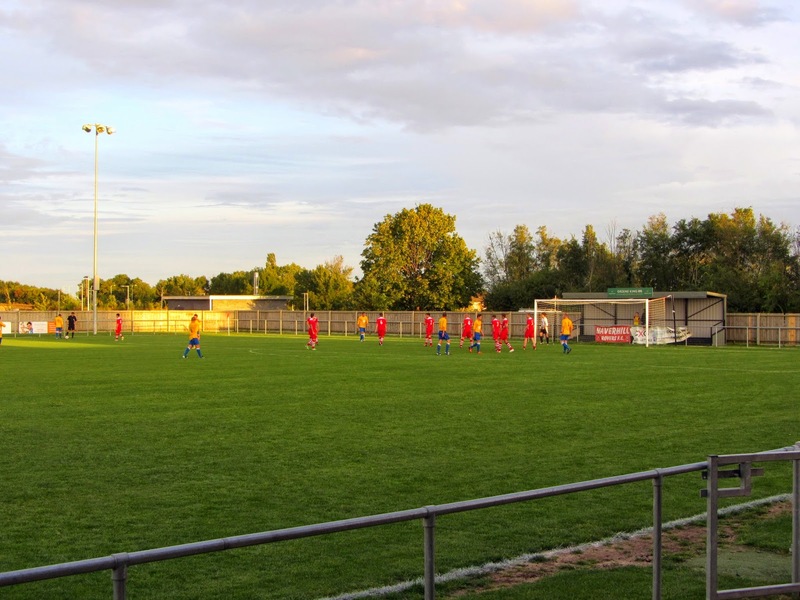 The visitors opened the scoring from the penalty spot in the 27th minute - Richard Chadwick was clumsily fouled in the box allowing Lee Clift to dispatch the resulting spot-kick. In the 36th minute Newmarket doubled their lead when Jake Wayne cut inside a defender before chipping the goalkeeper from 20 yards. Just a few minutes later it was 3-0 as Ollie Snaith's sweetly struck shot from the edge of the area went in off the post. Things didn't get much better for Haverhill in the second half, they fell four goals behind in the 51st minute when Andrew Claydon was left unmarked from a corner and was able smash the ball in off the crossbar. In the 66th minute the visiting side extended their lead to five as a Jack Higgs free-kick took a big deflection on its way past Adam Whybrow in the Haverhill goal. The bad night for the hosts was compounded in the 84th minute when they were reduced to 10 men after a wild tackle by Dan Cornwell on Newmarket goalkeeper George Lawton.